See also Union New by aphoria, Union Flat by aphoria. Info: Created on 8th January 2009 . Last edited on 30th June 2009. No real fonts were harmed in the creation of this one. Although I'm sure I've been influenced, I cannot directly attribute the source. Hahaha! It's better than any original! It's gorgeous! Very nice. Maybe flip the thickness in your cap 'M' diagonals. And I agree with Afojet, The Cap M's first leg should be the Thinner one, same for the Cap N.
This smells like Bodoni! you should call your Lawyer before Leonoka Sees this, LOL. Thanks everyone. I'll play around with the M and the N and see what happens. Per suggestions from afrojet and jmarquez, I changed the M and N. I also made a few very minor tweaks to some other caps. I updated the sample too. well you lost the Bodoni feel to it, in the M and N! I was talking about something like the image. But its still a nice serif Fontstruction. Ah, I see what you meant now. I tried to keep all the vertical lines thick and the horizontals very thin. The diagonals are a bit of a mix. I changed the N again and made the diagonal thinner. You could also do a version with flat serifs. I see you changed again. I like it! 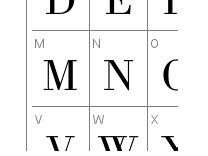 I tried thalamic's suggestions to the M, N, V, and v and I really liked the results. So I made the changes permanent and updated the sample too. I know what you mean. A fontus of the genenera giganticus needs more screen real-estate than is available. It's why I ultimately got tired of doing them.